These items tickled my funny bone. The Self-Stirring Mug from Hammacher Schlemmer, for those days when gravity is so heavy you can't even lift a spoon to stir the cream in your coffee. Or the honey in your tea. Tired of having your cocoa mix drift to the bottom of the cup? 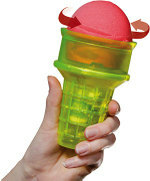 This little doo-dad has a tiny battery-operated propeller at the bottom that will churn the beverage within the cup and keep the mix ... mixed! It's got an on-off button on the handle and comes with a lid that keeps the liquid from spilling over while it is being churned. 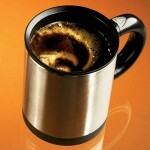 This is the ideal gift for the lazy coffee/tea drinker. And it's pretty too! Definitely one for MY wish list. I first ran across the Rotating Ice Cream device on the Patently Absurd Inventions Archive where you can see a design/drawing of the inner workings of the thing. But it's gone beyond the design and imagine stage. You can actually buy one at Hog Wild for $10. I first thought this has got to be the silliest invention ever. I mean, how lazy can you get. But I can see where folx with arthritis or other handicaps might find this "just the thing" so they don't have to give up slurping ice cream in a cone! This also runs on batteries and has an on-off button, thank god. But my question is, does it have speed control? I could see my nieces getting a chuckle out of turning it on and letting ice cream fly all over everybody, happily exploring the world of centrifugal force. Aaah, to be young and carefree. I have successfully navigated the world of homemade ice cream. Well, ok, not the WORLD of, just one tiny pre-mixed corner. I have yet to try a "from scratch" recipe, but that's next. I used the mix that came with my brandy new ice cream maker. It produced some very tasty chocolate ice cream, a little bit softish, but still quite acceptable. Only one thing ... I didn't make enough. The hubs wants more! Create the custard base: bring milk slowly to a boil in a saucepan. In a separate bowl, mix together the egg yolks and sugar, until thick. Add hot milk while stirring continuously. Pour entire mixture back into the sauce pan and heat gently, stirring until the custard thickens - DO NOT BRING TO THE BOIL OR IT WILL CURDLE. When you can see a film form over the back of your spoon it's time to remove the saucepan from the heat. Add the cocoa, cherries and chocolate chips and chill. Mixture should be VERY cold. Once chilled, mix until slushy. Add the cream (whipped) and make sure it mixes in well. 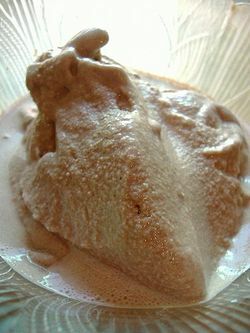 Transfer the mixture in an ice cream maker and freeze according to the manufacturer's instructions. There's something about the combination of chocolate and cherry flavors that really turns my crank. Heh, turns my crank, funny girl. No crank turning involved in THIS process, it's all electric now! And no rock salt. I have a friend who swears by the old fashioned method. She likes to have parties where the ice cream maker gets passed around and all the guests take turns at the crank. Personally, I prefer the easy way. I wish I had one of those poll takers, I'd like to know how many people prefer just plain chocolate ice cream. My top two are chocolate cherry and rocky road. Of course, chocolate syrup goes well on almost any kind of ice cream. So, what's your favorite variation on chocolate ice cream? 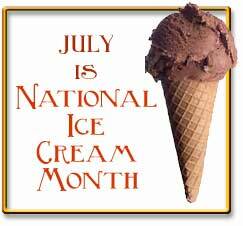 Well, I've missed the first 2 weeks of it, but July is National Ice Cream Month. I love ice cream. The only way to make this any better would be to make it National CHOCOLATE Ice Cream month. But according to American Food Holidays site, Chocolate Ice Cream Day is in June. What's that about? Anyway, I haven't been ignoring it. In the few spare minutes I've had, I actually went in search of an ice cream maker. I mean, a person really OUGHT to have an ice cream maker, especially they live in the hottest part of the universe. What better way to keep cool with all your favorite flavors? And what better month to take the plunge into homemade frozen ... stuff? My first venture was to my local Target. Would you believe it - no ice cream makers. Not one. I searched around online and couldn't make a decision. And then - yesterday while at the grocery store - I found one! I'm not too sure of the quality. I mean, it was in one of those "beat the heat" party displays, with other high-tech toys like the "make your own cotton candy" machine, and the fabulous home version of the hot dog rotator, so you too can have burnt hot dogs just like at the ball park. Honestly, these devices look to be one step above the Easy Bake Oven. I had my doubts about the quality of the ice cream maker too, but ... I had to try it, and it was cheap. It came with a bucket (for freezing your "Amazing Homemade Gourmet Ice Cream", four packets of Quick and Easy Ice Cream mix, and 3 little bottles of flavoring. The inner container is in the freezer now, only hours away from my first attempt at making ice cream. 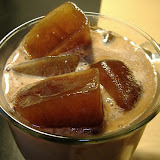 Hopefully I'll have something cold and brown and homemade to blog about for Chocolate Friday. Heh, I guess even if it's a disaster, I'll have something to blog about. Wish me luck! No chocolate on that list anywhere. What is that about????? Redemption can be found back on the American Holidays list, where July 25th is National Hot Fudge Sundae Day, and July 26th is National Coffee Milkshake Day. I may just have to slide those two together. You can make it ahead of time - let it cook overnight even. It's highly modifiable - ingredients can be added to suit any taste. It requires little to no attention once it's done - just set the crockpot dish on the counter and stick a spoon in it - leaving you free to mingle and hostess. It's delicious for brekky, brunch, or any meal. 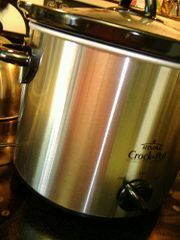 First I have to show off my new crock pot. I had such a hard time making up my mind what to buy. I finally settled on this little one (only 2 settings, and only 4 quart) since it's just me and the hubs, and 4 quarts is enough for most of the dishes I would make for the family gatherings. And since we work at home, we don't *really* need all the fancy knobs and dials and clocks and timers. I really wanted the really BIG one with 8 settings, digital timer, and multiple function inner pot. You know, the one that does everything except wash your windows. *sigh* Rationality won. But I promised myself that if this one turns out to be substandard to my needs ... returns and exchanges are in order. The hubs was happy that I didn't spend an arm and a leg, and that it matches our other kitchen appliances. As long as it cooks the food he won't care much about anything else. Ok, now for the recipe. I found the original recipe here. I don't know why I never thought of eggs in a crockpot. It makes perfect sense. It's just like a frittata, or baked egg casserole, cooked slowly until the eggs set up. And I think this WOULD have been PRETTY if it had been allowed to set up in layers ... heh, if I could have served it up as originally planned. But, the hubs ... got impatient. I went to check on the progress and found the hungry hubs had stirred it all up in an attempt to get it to cook faster. More than once. There went my pretty layers. GRRRR. He has been thoroughly lashed with a wet noodle and has promised not to mess with my cooking projects anymore. Until it gets served up. Spray inside of slow cooker with nonstick cooking spray. In small skillet, cook onion and green pepper in olive oil until crisp tender. Let cool about 10 minutes. Place one third of the frozen hash brown potatoes in the slow cooker. 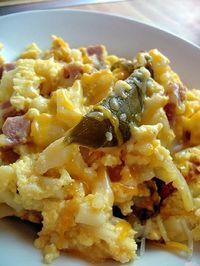 I served this with a small bowl of shredded cheese to sprinkle on the top while the eggs were still hot. I also mixed some shredded cheese into the potatoes for each layer, just to make sure there was enough cheesiness. The next time I try this I'm going to use broccoli and zucchini and maybe add a layer of diced tomatoes in there somewhere. Wow. It's gettin' close to the Carnival's 100th barfday. That's pretty cool. This week's 4th of July "Fireworks" edition is hosted by Caterwauling, and there are some spicy treats to try! I'm really not one for spicy foods, but the hubs likes to have smoke coming out his ears, so I may have to serve him up some of the BBQ General's Shrimp Stuffed Jalapenos. Note to self: Must have video camera handy. I really want to try Trinity Prep School's Ice Cream Pie. Sounds easy and delish. And for one of our family gatherings, I'm sureThe Common Room's recipe for Pizza Fondue will be a big hit. In my brandy-new crockpot! More on that later, with photos! Next week’s edition will be hosted at Blabber Heads, with a “Life’s a Beach” theme. I gather that means recipes to keep you in bikini-shape. I don't think I have any recipes like that. Can you say, carrot sticks? Heheh. Just kidding. Sort of. To submit your recipe, e-mail recipe.carnival AT gmail.com or use the Carnival Submission Form by noon Central on Saturday, July 8.